unfortunately I can't play with either of them at the moment as I'm supposed to be on my lunch break and am already late getting back to work. I love my post(wo)man too, every day im waiting on her. Today im looking out of my window every 15 min. Woman: Looks at the camera with a wry smile* as she had the hots for whomever is fleeing. *known as the 4th dimension, when actors looks into the camera as directly talking to the audience. Man: "Hey, I recognise this place! But what's with the blue roofs?" I haven't profiled my update yet! I love the postman today because he brought me some small surprises from kettlefish Thank you! Double doozy today! I got my Halflings from Cundco (along with a second set of 50/100 tiles) and also got kettlefish's special items. She hooked me up with a bunch of things including The Besiegers, the Spiel2014 tile, a very odd sticker signed by Klaus, a postcard, and a special punch-out version of Bohnanza. Very cool. With the Cundco package, I also got a pink Meeple-on-Board sticker as a bonus present from them. All I'm waiting for now is the Darmstadt expansion! Excellent, so it's a good day in New Zealand! I love the bonus presents that Cundco give people, they always seem to be very generous to me with stickers (I now have both the blue and the pink meeple on board stickers), little bags of sweets and even one of their stronger game carrying bags with my latest order. I'm never disappointed when I receive post from them. So, what's the verdict on the artwork in the new edition? From the pictures I've seen, my biggest issue has been the contrast in colour between the city walls and the city interior, although the level of contrast has varied in the pictures. I know that HIG explained on CarcF that introducing this contrast was important to them to make the city walls clearer, but it seems artificial to me. So, what do you think of the contrast? And what about the rest of the artwork - cloisters, the river, the infamous blue roofs etc? I ran the tile by my partner and she liked the detail of the tiles and thought the features do stand out more, but she also feels that the increased level of detail will introduce problems that have mostly been left out of the game. Considering she is a gender studies academic, those issues mostly have to do with sexism. On the new Spiel 2014 tile, you can look and see that there are actual people at the Spielfest booths visible on the tile. It's actually a good mix of male and female but it gets away from the cartoonish meeple-centered Carcassonne we've all been used to and brings it closer to the human figures represented by the Spielbox stickers released in 2012 or the "romance" tokens included in The Catapult. The new Meeple on Board stickers for cars also suggest a sexualization of Carcassonne that wasn't present before 2008. In other words, the art itself looks pretty good and the reasons behind the change are all legitimate. 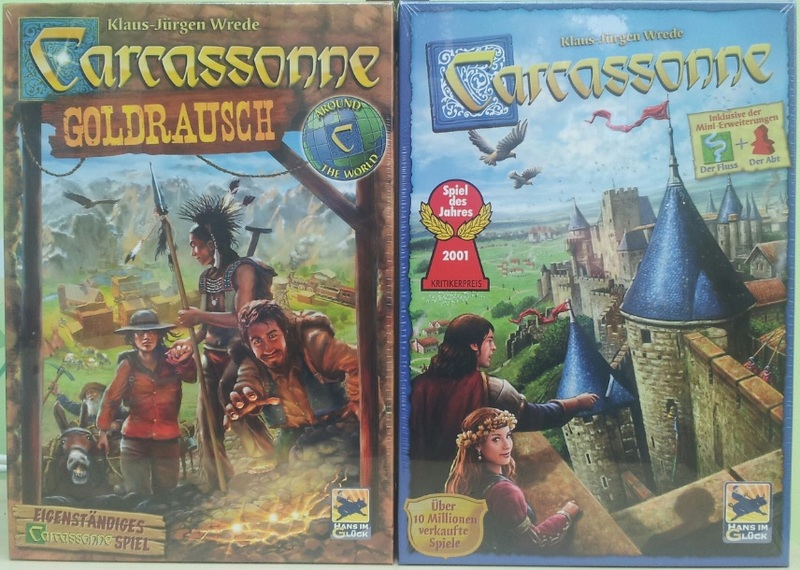 But the increased detail means that the old concepts that went alongside Carcassonne as a "meeple universe" are falling to the wayside in favor of a human-based game with all the gender implications that brings with it. I've sent to many members small surprisings, but I hadn't enough autograph cards and signed landscape tiles - so now this case is finished. I'm looking forward to using the signed tiles in my next game. Is the standard rule to award a bonus 10 points for playing a signed tile? Yes I think that was my idea and Klaus-Jürgen Wrede liked it too. Today i recieved my cundco order. Sadly for the first time cundco made 2 mistakes. I miss the RRRR tile from the festival. And ive ordered a female purple meeple but they send me a normal one. So i will mail them tommorrow.